People accessorize for many reasons: they want to enhance an outfit, make a statement about their personality, or just simply throw on accessories for utility purposes. Generally speaking, these things include necklaces, bracelets, bags, and other fashion items, but for some people, animals even fall into that category. Just as some people choose a patterned scarf to add a pop of color to their outfit, others choose exotic or unusual pets to pepper their style. This sounds like a rather absurd practice, but sadly, some people see no difference in their companion animals and their purses. However, where a pair of earrings can be shoved in a box after a day of use, a living, breathing animal needs real attention and care. The consequences of using animals as a compliment to your newest outfit or toting them around in your purse are serious. In 2011, for example, many rescues saw an influx of Bichon Frises, Chihuahuas, and Shih Tzus as a result of people buying them in imitation of Paris Hilton – who is not exactly an ideal role model when it comes to animal care. Some of the dogs wouldn’t even walk, because they were so used to being carried around, resulting in behavioral problems, making it even more difficult to find forever homes for these animals after they were abandoned. When we view animals as fashion accessories, they become objects and this perception leads people to blatantly disregard their sentience. The animals below are just a few examples of pet trends and fads that have had some rather unfortunate consequences. In the first decade of 2000, Tibetan Mastiffs became a serious status symbol in China. If you were wealthy, you didn’t purchase a car or fancy jewelry … you purchased a Mastiff. In 2010, MSNBC reported that a mastiff could cost around $600,000 – meaning it cost more to adopt one of these dogs than to purchase a house! But like most fads, the popularity of the Tibetan Mastiff quickly lost steam. Since these animals were seen as status symbols, when this trend died out in 2013, they were discarded like a pair of dirty socks. The New York Times recently published an article that revealed that Mastiffs who had lost their appeal were being sold for slaughter in the dog meat industry. Luckily, the twenty dogs featured in this piece were saved from slaughter by animal activists. If they were not rescued it is likely that they would have become food or imitation leather. This disregard for their lives shows they are viewed as little more than products to be consumed. Even when they were popular, they were mistreated; some breeders injected their “studs” with silicone to make them look more powerful and one Mastiff even died while getting a facelift operation (you read that correctly, plastic surgery for a dog). Similar trends occurred in China with other dogs such as German Shepherds and Golden Retrievers, but now the once popular Mastiffs are stuffed into trucks headed to slaughter unless they are lucky enough to be saved. Another animal trend with negative consequences is teacup puppies. Many people do not realize that toy dogs are actually different from teacup dogs, which are too tiny to be healthy. In fact, teacups are not even a real breed. “Teacup” dogs are usually created through breeding “runt” dogs. The runts of the litter are obviously adorable, but when the only characteristic valued in a dog is how tiny and cute it is, there are bound to be problems. Some of these problems include: heart issues, seizures, respiratory problems, blindness, limb deformities, and more. Tragically, these “adorable” puppies are frequently purchased by buyers who want them for their aesthetic value and lose interest when faced with the teacup dog’s health issues. Even worse, in some cases they grow larger than desired and are given away because they can no longer fit properly in a purse (which is no place for an animal to begin with). The teacup trend also transcends animal species from dogs to pigs. Lately, tiny pigs have been seen everywhere. They’re often called micropigs or mini-pigs. You can thank Paris Hilton once again for helping to popularize this trend in 2010 when she purchased one, but Miley Cyrus is also responsible for the continuation of this fad. 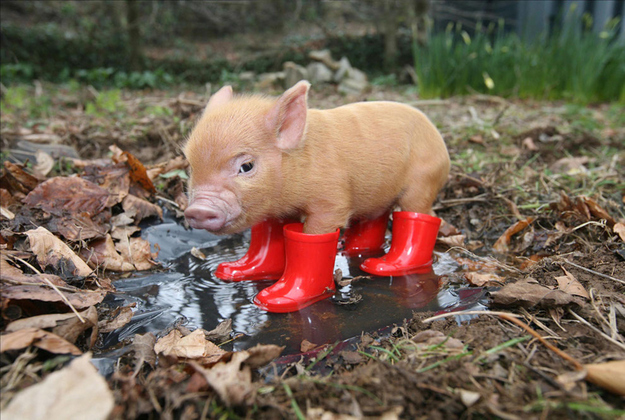 The reality of the situation is that teacup pigs are all hype and no substance in terms of their size. Pigs also have a range of requirements including open space and a pig companion that are often not met by people who carelessly purchase them. This results in a large number being dumped at rescues and sanctuaries. Animals deserve more than to be treated like the latest handbag or newest color of nail polish. They even deserve to be treated better than an expensive diamond ring, because they are living creatures with unique personalities and needs. These needs cannot be met when they are treated as nothing more than a compliment to someone’s outfit or symbol of their wealth. Maybe if all these celebrities and wealthy people would work to stop animal abuse instead of \’accessorizing\’, they would become useful members of society themselves. Fans that \’imitate\’ them are almost as useless. Well said. Thank you. I\’ve never thought of my 7 rescue dogs..chihuahua to pit/lab…as accessories. Simply as my lovies and best friends. I love them more than I do most of my relatives, especially my former siblings!! !